I don’t suppose so many of the readers here speak Serbian. And that is a shame since this fantastic fulm made by Serbian TV at the conference and workshop on “Are We lost in Online Space?” brilliantly picks up the energy and ideas from the 50 or so youth workers, mainly from east Europe, who attended the two day event. I was interviewed about Personal Learning Environments, one of the central themes for the conference. And in the first section of the video you can see the participants in a workshop drawing their own PLEs. Today the fellow-bloggers on Pontydysgu site can congratulate Graham Attwell on his birthday. I hope there is no home-made rule that would prevent us from celebrating this day via his own website. Cheers, Graham! Are we lost in online space? Last November I was invited to give a presentation at a conference “Are we lost in online space?” organised by in Belgrade. As the report on the conference web site says, the conference brought together 48 participants, most from east Europe, and 6 experts in the field of online learning. Participants had the opportunity to learn, experience and discuss about digital pedagogy, personal learning environment, online counseling for youth at risk, the possibility to educate youth workers in the online context, the ability of young people to use online tools when they are used for educational purposes, using games with young people, the potentials of using the virtual reality packages in youth work. It was a lively conference with a wide range of different experiences and views and some great participatory workshops and activities. It was apparent that at least from the countries represented in the conference, technology is a relatively new field in youth work, but also that many youth workers are ready to engage with young people through technology. However, tools and platforms such as Moodle seemed really not to support the pedagogy of youth work, nor to engage with young people. Youth work is more about informal learning – and ed-tech has tended to focus on formal learning. There was a quick straw poll at the end of the conference on whether or not we were (still’ lost in online space. Participants were divided – some lost, some not and some not sure! Posted in Digital Identities, e-learning 2.0, education 2.0, Informal learning, online communities, open education, Pedagogy, Social Software, socialmedia, teaching and learning, Wales Wide Web | Comments Off on Are we lost in online space? With my latest blog I started a series of blog posts that reflects on the final review of the EU-funded Learning Layers project (exactly one year ago) and on our progress with follow-up initiatives. The first post looked back at the review event and at the blogs that I had written on the event and on the follow-up activities. At the least it gave a picture of a ‘milky way’ of posts reporting on meetings with different partners – either within ongoing projects or as preparation of new initiatives. to provide the participants digital tools that support their self-organised learning between course periods. In the year 2017 major progress was achieved with a working group of part-time trainers (lecturers) responsible of different subject areas. A development website was launched to shape a set of integrated projects and for uploading relevant content. In addition, a working agreement was reached, how to integrate this development website to the course management system of Bau-ABC and how to make the digital content available for the learners. In this arrangement it was agreed that the Learning Toolbox will be used as the learners’ tool (and interface with the learning content). In the meeting last week several points were discussed on the finalisation of the software architecture to be used in the pilot activities in the coming weeks. Another follow-up initiative that was started after the final review was the company-specific pilot with the construction company H. This company is a medium-sized enterprise that has specialised in pipeline-building and installations (water and electricity). The company has several regional offices and its construction teams are working in a wide area in North Germany. The starting point of the cooperation was a feasibility study that was prepared by the developers of the Learning Toolbox (with support from the ITB team). This study made recommendations for the improvement of the system solutions and the software architecture of the company – to improve the sharing of information between the offices and the construction teams. Already in this context the Learning Toolbox played a role. As a spin-off from this study, the partners prepared also a project initiative to use Learning Toolbox as means to improve the communication and knowledge sharing between apprentices and in-company trainers. The pre-proposal had been accepted by the funding body and the partners were invited to submit a detailed proposal for a project that is due to start in Spring 2018. This proposal was discussed last week in the meeting between the partners involved in the project. One of the pain points for promoting the use of digital tools in construction work was the lack of appropriate hardware that is robust enough and well-protected from bad weather conditions, but at the same time provides access to relevant apps and software. On larger construction sites the companies have tried to introduce ‘BIM-Kiosks’ or ‘BIM-tables’, mainly to support the work of construction site managers and/or supervising engineers. This idea was picked by several Learning Layers partners (including CIMNE, ITB and some craft trade companies) but with the emphasis on similar needs of SMEs, smaller construction sites and mobile teams of construction companies. The construction sector partners have strongly underlined the need for a ‘mobile office hardware set’ (BIM-Koffer) that could provide a WLAN for the construction site and link to internet from remote locations. Whilst the design of such a hardware solution hasn’t fallen into the scope of funding programmes, a pilot team has come up with a plan to prepare a prototype that can be used in small-scale pilots and eventually in funded projects. In this initiative both the access to BIM software and to Learning Toolbox play a role. One of the delightful news of the year 2017 was the broad-based and successful use of Learning Toolbox as a conference tool to create ePosters (and mini-posters for poster-walls) in the AMEE 2017 conference. This pioneering exercise has been well documented by the introductory videos and by the showcases on the Learning Toolbox site. Based on this success story, another way of using Learning Toolbox with ‘hybrid posters’ was tested in the EC-TEL 2017 conference. I guess this is enough updating on the projects and project-like initiatives that involve several partners. On top of this we learned a lot of further work with the Learning Toolbox within the training centre Bau-ABC Rostrup. But that is already a topic for a further blog post. One year ago we had the pleasure to organise the final review of our EU-funded Learning Layers (LL) project (2012-2016) here in North Germany. The main argument to locate the meeting ‘in the field’ was that in this way the consortium and the reviewers could get a better impression on the impact of our work on the application partner organisations and their work. Therefore, we had most parts of the review meeting in Verden at the premises of Norddeutsche Zentrum für Nachhaltiges Bauen (NZNB). This centre for ecological construction work had worked as an application partner in the construction pilot of the LL project. 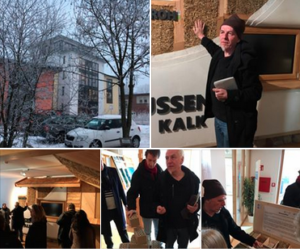 Also, in the premises of the NZNB the participants could see the permanent exhibition and attend live demonstrations on working with ecological materials in construction work. The idea, to bring the review to such a location was received well. Also, trainers from the construction industries’ training centre Bau-ABC Rostrup could participate and give their contributions on the impact of the project on their work. The pictures below give an impression on the environment and on our tour round the premises. Altogether, we – reporting from the sectoral pilots – gave a picture of pilot teams working intensively with the application partners in the pilot organisations (in particular with the training centre Bau-ABC and the network for ecological construction work). The development of the digital tools and the mobile learning technologies was driven as a participative process in which the technical partners adjusted their ideas to the contexts and users’ potentials. These messages were summarised in two further blogs that I wrote shortly afterwards – to support the final edition of our final ‘final report’ that we were required to submit in addition to the final reporting on the website “Learning Layers Results“. In this way we managed to reach a phase in which the Learning Toolbox was a usable tool in different contexts of the construction pilot – and its potentials had been discovered in other application contexts. These were the blogs that I wrote before the summer holiday break. After the summer holidays my work situation changed slightly and I didn’t have a similar possibility to accompany parallel activities. Yet, I could make some notes on the further progress with the activities in North Germany and on the use of Learning Toolbox in conferences. So, as we can see from the long list of blogs, there was all the time something going on. And indeed, the Learning Toolbox was being developed for further contexts and users. Moreover, we – as accompanying researchers – felt the need to work with these initiatives. In particular, we wanted to learn, how the introduction of digital tools into work-related or organisational learning opens new frontiers to be explored. But this is already a topic for a further post.